the F2P model is seen by many gaming critics as the future of the MMO world, whether gamers like it or not. The only thing that surprises me a bit, is the speed at which F2P is released. Then again, the faster it comes, the less time there is for players to worry. F2P in SWTOR will be available this November. I play two MMO's that are based on different business models. On one side there's SWTOR, which currently works with a monthly subscription model. On the other side there's LotRO, which has a hybrid model of so called "VIP's" (consisting of monthly subscribers and oldschool life timers) who get most content automatically, and F2P players who don't and have to buy individual quest packs. On first sight, the LotRO system looks the most appealing, and there are many people who praise it. If you haven't played for a while, it's quite easy to get back into the game without having to pay for anything and can just enjoy yourself familiarizing yourself again. If you get caught up enough you can choose to buy a quest pack or expansion, or start subscribing again. This seems to be the way to go for online games in a time when there are very many MMO's offered and an increasing amount of players don't stick to one MMO, but rather 'butterfly' from game to game. Another often heard argument for F2P is that you "pay for what you play": you can carefully pick what you want to do and only pay for that. If you never raid, you don't buy that content and you don't indirectly pay for them through a subscription fee either - at least, that's the idea. In LotRO, it's even possible to receive small amounts of Turbine Points or 'TP' (the coinage used to buy quest packs and other things in the in-game store) by completing in-game achievements ('deeds'). So of course there are people who make a sport out of it and try to progress in the game by only completing deeds and buying quest packs from the TP earned through that. A journal of a LotRO player trying this out can be found at Wynnie goes Free to Play. Sounds great, right? So would could possibly be wrong with the LotRO system? Subscribing doesn't give you everything there is. A subscription used to include everything apart from expansions. This has changed. Store items include things you can only get through the store, and in some cases this are game system things that would've been given to everyone as an update in the pre-F2P era. For instance the barter wallet, that lets you store barter items in there instead of in your bags, freeing up loads of bag space. In practice, this means that subscribers pay the same, but get less. In-game advertisement environment. There is a tendency to trick players into buying more. This is easy to spot for players who have played LotRO since the launch in 2007 and still do as of today. Where the game used to be only about having fun in Middle-earth, now there are buttons hidden everywhere that lead you to the LotRO store. Need to complete a deed to get a virtue sorted? If you click on it, you'll get directed to the store, where you can buy the virtue and don't need to do anything in-game. Recently, festival activities have been introduced with an extremely rare chance to get a certain mount or item. Of course, if you aren't lucky enough, you can always buy it in the store. These are just two examples how sneaky advertisements try to lure people into buying more. For me, they distort immersion with the beautiful world of Tolkien. Distrust in game companies. Many long-term players have become distrustful of Turbine because of not keeping their promises. With the introduction of F2P, players where soothed from their fears by being promised they wouldn't introduce so called "pay to win" (P2W) items. They took this back, and introduced items that give you clear advantages in PvP areas. There's also a history of enthusiastically announcing new things, which afterwards turn out to be only available by paying separately for them when they were implemented (the sixth bag and, again, the barter wallet come to mind). This feels like misleading. It's not fun to pay a company you dislike, and many old time players I know have left because of it. Comic of Dilbert, by Scott Adams. Don't get me wrong, F2P was probably a good thing for LotRO. Without it, it might very well not exist anymore. During the time of the Mirkwood expansion very little people were around, and logging in would really give you the feeling of a dying game. There wasn't that much new content and people were generally disappointed and left the game. It was getting quiet, very quiet. F2P brought an influx to the game that made it thriving again. However, all the marketing of the LotRO store makes me feel sad. It doesn't fit with Tolkien's world at all. I just want to play my elf again, wandering through the woods without being interrupted by some sort of store advertisement every so-many minutes. SWTOR still has all options open: F2P could turn out to be great. I'm sure the game will get an influx of players, a boost that could help the game a lot. So far, it looks like they give subscribers full access and F2P'ers limited, which is the common solution that works well. I hope they won't place many attention calling advertisements everywhere, but I suppose they might need that to get money flowing. If they do, I can only hope they will give subscribers a break from it. That would be a great quality of life improvement. The only reason I still play LotRO is because it has a great community, because the content is good and because I'm a huge Tolkien fan. If SWTOR goes down the LotRO F2P road, I might not have the same patience. 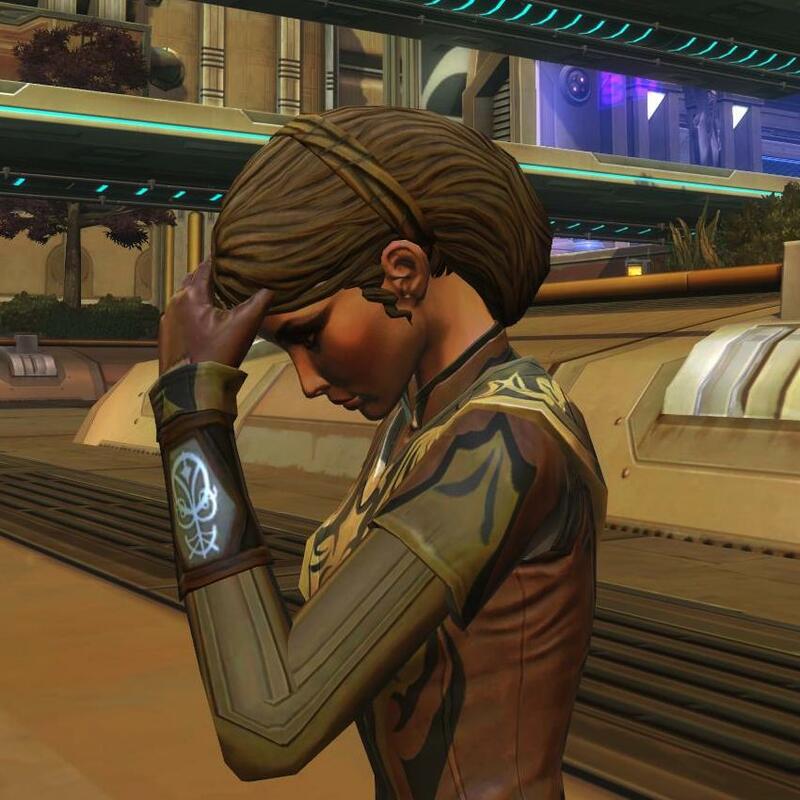 That said, SWTOR now has the opportunity to "do it right", and I genuinely hope they will. Apparently Champions Online does f2p but I've heard it widely praised as it actually sticks to just selling fluff. If Lotro would have stayed like that, fluff, cosmetics, deed accelerators, extra storage.. I'd be okay with it. But as you mentioned "Subscribing doesn't give you everything there is.".. that's what I have a problem with. Too often they've taken our suggestions and desires, implemented them but then made them an extra paid feature. I don't agree with that at all. When I hear a game is going f2p, it worries me given what Turbine has done. But I guess it's best to keep hopes up and wait and see if SWTOR does it well! Sounds good for Champions Online, then. I do think F2P resulted in nice content for LotRO and don't know if they could've done the same if they only charged the fluff. They should have, really, but I guess it's all looking at IF's anyway. I surely hope SWTOR is going to be at least just as great as it is now. And about the content... well, at least they did get that reasonably right in LotRO so far. Hopefully SWTOR will invest in that as well. We'll see! I agree. I try to give Turbine credit where it is due. I thought the Great River was well done and I see encouraging things like getting Chance Thomas back to do the music. I'm hesitant to say that these problems will exist in SWTOR, simply because they existed in LoTRO. The situation is similar, and they really need some moolah, but I'm still giving them the benefit of the doubt until the problems actually arrive. Yes, I think most of us bloggers had some notes and half an article ready for when this happened. This thing screamed F2P for months. If I sounded as if I expect SWTOR to end up with the same model as LotRO, sorry for not being clear enough, that's not what I meant. For LotRO, the content actually improved after F2P was improved, so you don't hear my complaining! I certainly hope F2P will work out well for SWTOR as well. Rav, your evaluation is excellent. Your article summarizes it so well. Bullet point 1... "I can try everything I feel like without feeling any pressure." Totally get that. Given finite time, the last thing I want to do is think about whether I can or cannot get somewhere I want to go because it is locked when I could have chosen a different payment plan that gave me free reign to explore. The part about not getting everything... with a subscription or lifetime, we get the 500 TP per month. It seems totally reasonable to believe that one could pay for a one-time barter wallet (995), sixth bag (995), or my personal pet peeve the one-use LI relic removal scroll (295?) without spending more than the subscription, and still offering the flexibility to get what you want/need/fluff. Of course, as you noted, the "try everything I want" aspect lends to my spending all my would-be excess TP on fluff and horse fixation. I teeter on the slightly annoyed but not enough to care as this is my hobby and I very much want the game to do well. That's a really good point, Danania, and my answer brings us back to point 1). The free TP's combined with content that's only available through the store force me to look at the store again and decide at what I want to buy. It's of course very smart of Turbine, for they now have the perfect excuse to make more things Store-only. As you say, "subscribers can buy it from their free fee, so they shouldn't moan". Right? For me, this still isn't ideal. Even as subscriber (who one would expect to be "all-in") you have to participate in the F2P system. Relic removal scrolls... don't get me started! You do realize that you used to just get all your relics back after you deconstructed an LI, right? When they introduced the removal scrolls, it was one of the things that made me wonder if I shouldn't leave this game. They actually took a part of a game system away to make it store-only. This was the start of a trend to make more things that would normally be considered content store-only. The free TP's aren't free in the sense that you have to spend them on things that used to be normal game content. And they might seduce you into buying other nice things instead (e.g. cosmetics), so that you'll have to buy TP after all, even as a subscriber. Don't get me wrong, I still love LotRO. I think this is more of a problem for people who have played the game for many years and see it change than for people who just enter now. They will take it for what it is. I'm happy for you that you're not that annoyed, though. LotRO is an amazing world that deserves to be enjoyed. I have to say I've not been able to make up my mind about SW:TOR going F2P simply because we don't know enough of what it will entail. Like the Cartel Coins...will subscribers get them each month after F2P launches? And how many would we get? And how much will stuffs cost? And will F2P peeps be able to get the ingame? Until I know stuff like that, I can't say yay or nay. When LotRO went for the F2P model, I was a bit worried about it. But it seems to be working nicely...apart from the fact that they will now sell ANYTHING in the LotRO Store and not just fluff (and quest packs and such). 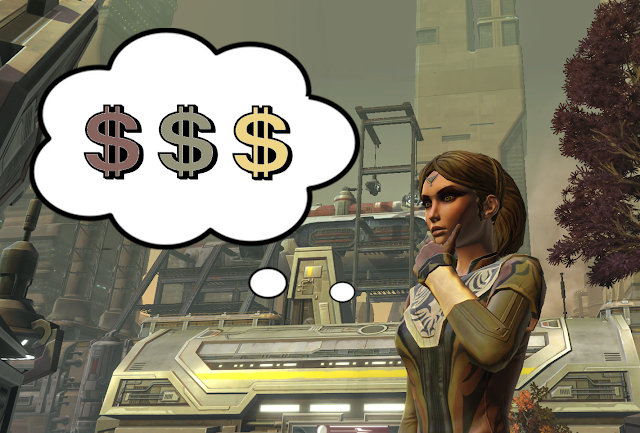 Are you thinking of giving SWTOR a try when it goes F2P? SWTOR: It's world boss time!